MISSES' SIDE-GATHERED, LONG SLEEVE DRESS WITH BEADED TRIM Very close-fitting, lined dress has right armhole and left side gathers, lower left side seam with slit, back-V, bateau neckline, invisible zippers at back and sleeve seams, and train. Optional: Beaded trim. For two-way stretch knits only. FABRICS: Two-way Stretch Knits: Stretch Velvet, Sequin Mesh, Rayon/Spandex. Lining: Tricot. Unsuitable for obvious diagonals. NOTIONS: One 22" (56 cm) Invisible Zipper, Two 7" (18 cm) Invisible Zipper. One Hook & Eye, 3/4 yd. (0.7 m) Stay Tape. Optional: 3/4 yd. (0.7 m) Approx. 31/2" (9 cm) Beaded Border Trim. Misses' and plus size special occasion dress or gown with side zipper has one shoulder look with optional shoulder strap. Add flower or bow accent to shoulder strap. A is above knee length. 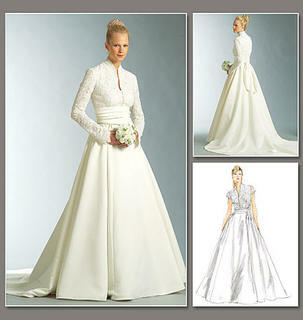 B Mini length B and C floor length with side slit have a sheer overlay with cascading asymmetrical hem. Jessica McClintock for Simplicity. Out of Print Misses' special occasion dress in two lengths. Jessica McClintock Pattern Collection. Lined dress, floor length, has princess seams, close-fitting bodice, raised waist, flared, back pleated skirt and back zipper and button trim. 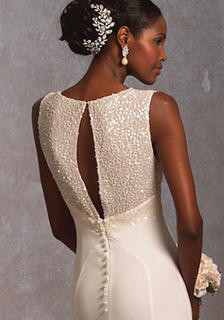 A: back extends into train, contrast sleeves and purchased lace trim. Bellville Sassoon Dress. Fitted, lined dress has princess seams with bow and front bra, back invisible zipper closing and neck straps. Built-in foundation with boning, hook and eye tape closing. Floor length. 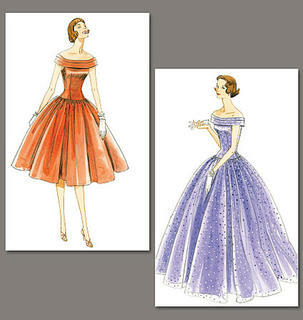 FABRICS: Duchess Satin, Taffeta, Silk-like Faille, Brocade and Silk Dupioni. MISSES VEIL: All have purchased combs and/or headpiece, length variations. A: purchased optional trim. A, B: blusher. C, D: circular. D: purchased ribbon. B, C, D, E: purchased flower variations. F: bow with knot. MISSES'/MISSES' PETITE DRESS AND DETACHABLE SLEEVES: Close-fitting, underlined, lined, flared, floor length evening dress with drape effect, princess seams, back zipper closing and button trim. 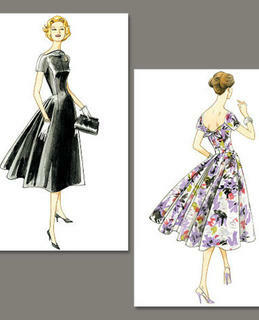 Detachable sleeves variations.FABRICS: Dress A: Peau de soie, Charmeuse and Crepe. 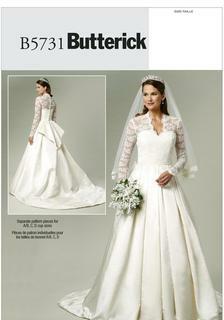 Detachable Sleeves B, C, D: Stretch Tulle. MISSES' DRESS: Close-fitting, lined, princess seam dresses A, B have interfacing and boning in bodice, lapped zipper closing. A: contrast band and bow. B: contrast lace overdress with scalloped edge trim, contrast drape with purchased decorative pin and covered buttons in back. 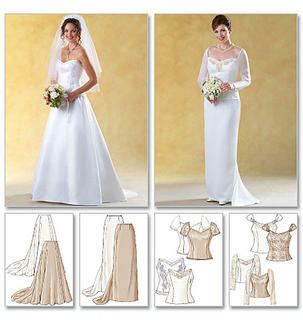 FABRICS: Dress A, B: Satin, Crepe, Peau de soie and Charmeuse. 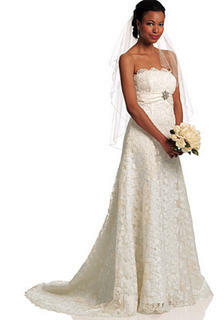 Contrast 1B: Single-edged Scalloped Lace. Underlining/Lining: Lining Fabric. Unsuitable for obvious diagonals. 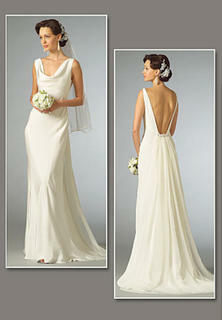 MISSES' DRESS: Close fitting, lined, bias dress has front self faced drape over front bodice and back invisible zipper. B,C: Slight train. C: Purchased trim. Designed for soft to lightweight woven fabrics. 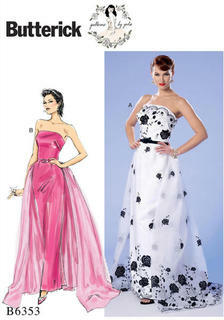 FABRICS: Faille, Crepe, Satin. 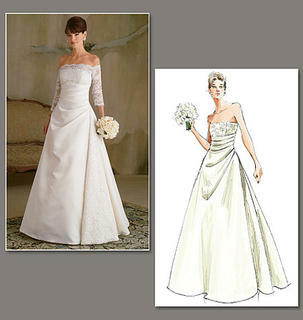 MISSES' DRESS: Lined dress has raised neckline, close-fitting, underlined bodice and under bodice, boned under bodice, underlay, pleated skirt with side front seams and back zipper.A/B,C,D Cup sizes. FABRICS: Peau De Soie, Satin. Contrast: Double Edged Scalloped Lace. Underlining/Lining: Lining Fabrics. Underlining 1: Tulle. Underlining 2: Netting. 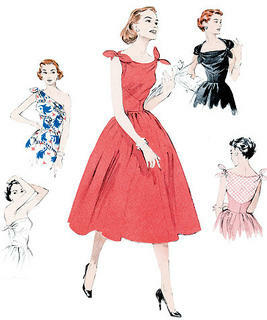 MISSES' DRESS: Lined, underlined dress has princess seams, close-fitting bodice (contrast back), semi-fitted skirt, shaped back hemline and back button loop closing/trim. Back extends into train. A: contrast lower sleeves with button/loop closing. 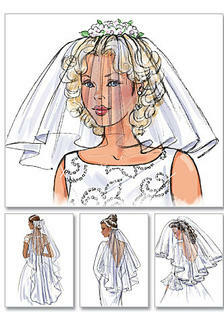 Note: motifs are cut from lace fabric. Designed for soft lightweight woven fabrics. FABRICS: Satins, Crepes, Peau De Soie. Contrast 1: Re-embroidered Lace. Contrast 2: Stretch Illusion. Lining/Underlining: Crepes De Chine. 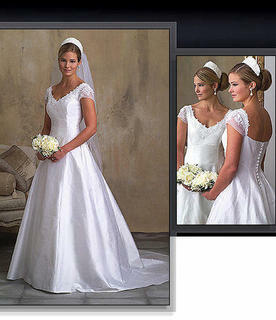 MISSES' DRESS AND SASH: Dress has close-fitting, underlined, boned bodice, princess seams, and back zipper. A, B and C: semi-fitted skirt with princess seams and back vent. D and E: pleated skirt. C, D and E: drape. Note: diagrams shown for a variety of looks. Single-layer sash. Sash and drape have raw edge finish. B is shown with sash F. Separate pattern pieces included for A/B, C, D cup sizes. Designed for light- to medium-weight woven fabrics. Fitted, strapless dress has fully underlined, boned, lined bodice with pleats at bust, front and back darts, and back zipper. Train has band, hooks & thread eyes and train lining. A: Border print. A, B: Belt with purchased prong buckle. FABRICS: A: Sheer Embroidered Border Prints. B, Underlining/Lining 1 A, Belt A: Peau de Soie, Crepe. Also for B: Brocade, Taffeta, Jacquard. Underlining/Lining 1 B: Lining Fabric. Underlining/Lining 2 A, B: Felt, Interfacing Fleece. Train Lining A, B: Netting. Unsuitable for obvious diagonals. NOTIONS: One 18" (46 cm) Zipper, Six Hooks & Eyes, One 1" (2.5 cm) Buckle with Prong, 23/4 yds. (2.6 m) Boning, Four Metal Eyelets, Seam Binding.